Sheik Hasina Wajed, the 63-year-old leader of the left-of-center Awami League, has a history of surviving. During a 1975 coup d'état, assassins killed 17 members of her family  including her son, three brothers, mother and father, former Prime Minister Sheik Mujibur Rahman. Hasina, then 28, happened to be abroad at the time. She later survived a grenade attack that killed more than 20 people, dodging the bullets that sprayed her car as she fled. 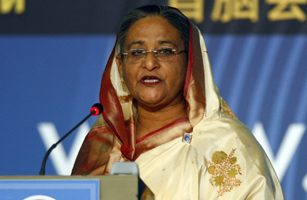 Hasina was first elected Prime Minister in 1996. But in 2001, Transparency International named Bangladesh as the most corrupt country in the world, and Hasina was ousted in a landslide. That wasn't the end of her, though. In January 2009, the Awami League won 230 of 299 parliamentary seats, and the consummate survivor found herself Prime Minister  again. See pictures of Bangladesh and Pakistan's forgotten war.